What inspires outstanding personal achievement…day-in and day-out? Do successful people really do things differently? They certainly do, says acclaimed author Stephen Covey. And in this powerful audio program, based on his New York Times #1 bestseller, he reveals the 7 habits all successful people share – and shows you how to make them a part of your everyday life. Learn the timeless value of “the character ethic.” Discover how to create your own “paradigm shift.” Unlock new levels of thinking and perception to create new vistas of achievement and fulfillment. You’ll be able to concentrate your efforts to exceed your goals, renew yourself continually – physically, mentally, and spiritually – gain inner strength, and free yourself from the constraints of others. 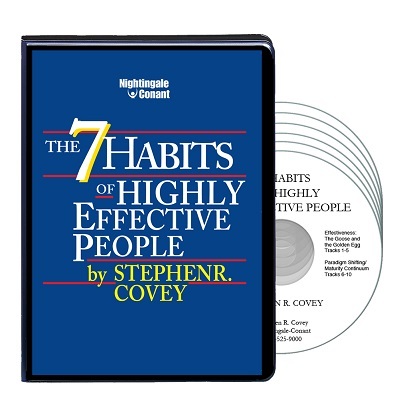 Here are Dr. Stephen R. Covey’s The 7 Habits Of Highly Effective People put in perspective. Habit 2: Begin with the end in mind. It’s so simple, yet so powerful. Covey argued that creating a “mental vision” for where you want a particular project or initiative to end up is essential to deciding how you will conduct yourself. Consider business meetings. If we asked ourselves how we want our meetings to conclude, how much more effective would our meetings be? Covey’s brilliance was arguing that we should start with the end first. Habit 6: Synergize. The word synergy is often nothing more than jargon, but the way Covey used it, the term was both practical and profound. Said Covey; “Synergy is about producing a third alternative — not my way, not your way, but a third way that is better than either of us could come up with individually.” Covey was referring to the need for communicators and leaders to be creative negotiators that build powerful relationships with others. The 7 Habits Of Highly Effective People embodies the basic building blocks of human effectiveness. Gain the habits and achievement of the world’s most successful people. YES! I want to learn the 7 habits that all successful people share and make them a part of my everyday life. The 7 Habits Of Highly Effective People, today for $57.95, which is 75% OFF the regular price of 239.95.